Queen Mother Nanny, the great 18th century leader of the Windward or Eastern Jamaican Maroons. She is famous for her heroic struggle against the British colonial empire and its institution of slavery in Jamaica. There are numerous legends and superstitions attributed to this great rebel leader. Queen Nanny, born in Ghana in western Africa, to the Ashanti tribe, was brought to Jamaica as a slave, ( there are references to her coming as a free African dignitary). There were already slave rebellions taking place in Jamaica, rebellion and Maroon villages were growing. 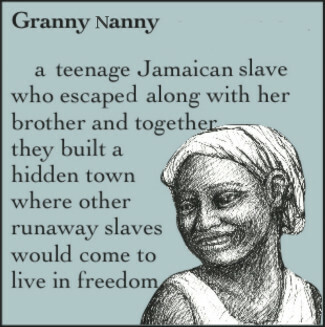 Soon after arriving in Jamaica, Nanny and her five brothers escaped from slavery. Her brothers Cudjoe, (also a famous Maroon leader) Accompong, Johnny, Cuffy and Quao, became leaders of the Maroons, which included free Africans, escaped slaves. By 1720 Nanny had taken full control of the Blue Mountain Rebel Town. It was renamed Nanny Town. There Nanny, and her people had cleared land for food cultivation. She was said to have had an excellent knowledge of herbs, as well as being a nurse and a spiritual leader.